Can a Classroom “Sound Good” to Enhance Speech Intelligibility for Children? The architectural design of classrooms should account for premises that influence the activities taking place there. As an example, the ergonomics of tables and chairs should fit pupils’ age and change with school grades. Shading components should be easily integrated with windows so that excessive light doesn’t interfere with visual tasks. Together with these well-known aspects, a classroom should also “sound” appropriate, since the teacher-to-student communication process is at the base of learning. But what does this mean? First, we must pay attention must to the school grade under investigation. Kindergarten and primary schools aim at the direct teacher-to-student contact, and thus the environment should passively support the speech. Conversely, university classrooms are designed to host hundreds of students, actively supporting speech through amplification systems. Second, the classroom acoustics need to be focused on the enhancement of speech intelligibility. So, practical design must be oriented to reduce the reverberation time (i.e. reducing the number of sound reflections in the space) and the noise levels, since these factors are proved to negatively affect teachers’ vocal effort and students’ speech intelligibility. Acoustical interventions typically happen after a school building is completed, whereas it would be fundamental to integrate these from the beginning of a project. Regardless of when they’re taken into consideration, it is generally due to the use of absorptive surfaces positioned on the lateral walls or ceiling. Absorbent panels are made of materials that absorb incident sound energy because of their pores, like those found in natural fiber materials, glass or rock wool. A portion of the captured energy is transformed into heat, so the part of energy again reflected as sound into the space is strongly reduced (Figure 1). However, recent studies and standards updates investigated whether acoustic treatments should include both absorbent and diffusive surfaces, to account for the teaching and learning premises at the same time since an excessive reduction of reflections does not support speech and is proved to require higher vocal efforts to teachers. 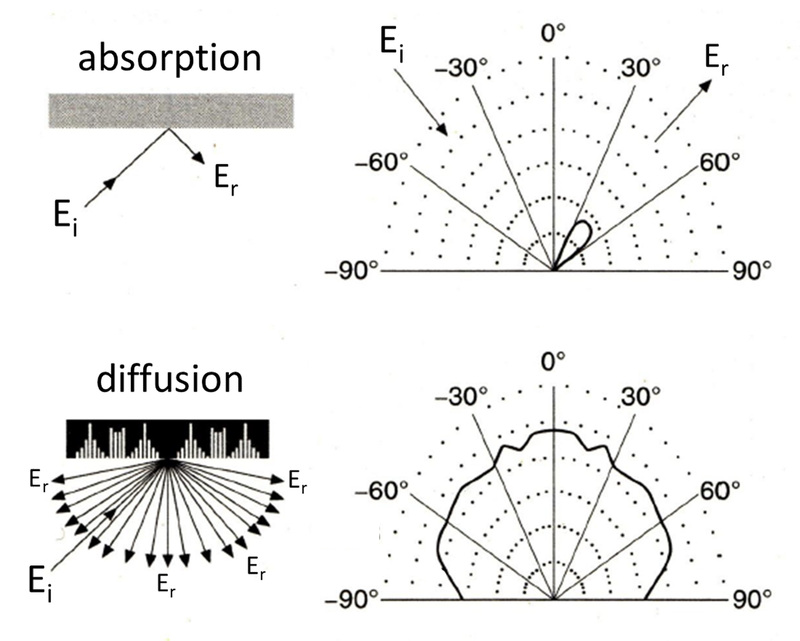 Figure 1 – Scheme of the absorptive (top) and diffusive (bottom) properties of surfaces, with the respective polar diagrams that represent the spatial response of the different surfaces. In the top case (absorption), the incident energy (Ei) is absorbed by the surface and the reflected energy (Er) is strongly reduced. In the bottom case (diffusion), Ei is partially absorbed by the surface and Er is reflected in the space in a non-specular way. 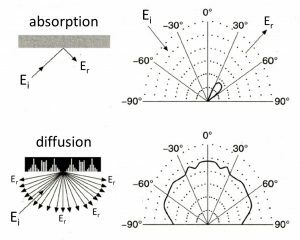 Note that these graphs are adapted from D’Antonio and Cox (reference: Acoustic absorbers and diffusers theory, design and application. Spon Press, New York, 2004). Therefore, we found that optimal classroom acoustic design should be based on a balance of absorption and diffusion, which can be obtained by means of the presence of surfaces that are strategically placed in the environment. Diffusive surfaces, in fact, are able to redirect the sound energy in a non-specular way into the environment so that acoustic defects like strong echoes can be avoided, and early reflections can be preserved to improve speech intelligibility, especially in the rear of a room. The few available studies on this approach refer to simulated classroom acoustics, so our work is a contribution to the research aiming to go further with new data based on measured realistic conditions. We looked at an existing unfurnished classroom in an Italian primary school with long reverberation time (around 3 seconds). We used software for the acoustical simulation of enclosed spaces to simulate the untreated room and obtain the so called “calibrated model” that gives the same acoustic parameters of the ones measured in-field. Then, based on this calibrated model, in which the acoustic properties of the existing surfaces fit the real ones, we simulated several solutions for the acoustic treatment. This included the adjustment of absorption and scattering coefficients of surfaces to answer to characterize different configurations with absorbent and diffusive panels. All of the combinations were designed to reach the optimal reverberation time for teaching activities, and to increase the Speech Transmission Index (STI) and Definition (D50) parameters, which are intelligibility indexes that define the degree of support of an environment to speech comprehension. Figure 2 – Schematic representation of the investigated classroom. On the left, it is represented the actual condition of the room with vaulted ceiling and untreated walls; on the right, the optimized acoustic condition is given with the use of absorptive (red) and diffusive (blue) panels that were positioned on the walls or on the ceiling (as baffles) based on literature and experimental studies. The typical position of the teacher (red dot) desk and position in the classroom is given in the figure. Figure 2 illustrates the actual and simulated classrooms where absorptive (red) and diffusive (blue) surfaces were placed. The optimized configuration (Figure 3 for an overview of the acoustic parameters) was selected as the one with the highest STI and D50 in the rear area, and consisted in absorbent panels and baffles on the lateral walls and on the ceiling and diffusive surfaces on the bottom of the front wall. Figure 3 – Summary of the acoustical parameters of the investigated classroom that are referred to the actual condition of the room. Values in italic represent the outcomes of the in-field measurements, whereas the others are obtained from simulations; values in bold represent the values that comply with the reference standard. If an average was performed in frequency, it is indicated as subscript. The scheme on the right represents the mutual position between the talker-teacher (red dot) and the farthest receiver-student (green dot), where the acoustic distance-dependent parameters of Definition (D50, %) and Speech Transmission Index (STI, -) were calculated. The reverberation time (T30, s) was measured in several positions around the room. We evaluated the effectiveness of the acoustic treatment as the enhancement of speech intelligibility using the Binaural Speech Intelligibility Model. Its outcomes are given as speech reception thresholds (SRTs) to give a fixed level of speech intelligibility, set to 80% to account for the listening task that is related to learning. Across the tested positions that accounted for several talker-to-listener distances and noise-source positions (Figure 4), model predictions indicted an average improvement in SRTs up to 6.8 dB after the acoustic intervention that can be “heard” experimentally. Here you can hear a sentence in the presence of energetic masking noise, or noise without an informational content, but with a spectral distribution that replicates the one of speech. Here you will hear the same sentence and noise under optimized room acoustics. Figure 4 – Scheme of the tested talker-to-listener mutual positions for the evaluation of speech intelligibility under different acoustic conditions (i.e. classroom without acoustic treatment and with optimized acoustics). The red dots represent the talker-teacher position; the green dots represent the listener-student positions; the yellow dots represent the noise positions that were separately used to evaluate speech intelligibility in each listener position. To summarize, we demonstrated an easy-to-use and effective design methodology for architects and engineers of classrooms, and a case study that represents the typical Italian primary school classrooms, to optimize acoustics for a learning environment. It is of great importance to make a classroom sound good, since we cannot switch off our ears. The premise of hearing well in classrooms is essential to establishing the basis of learning and of social relationships between people.